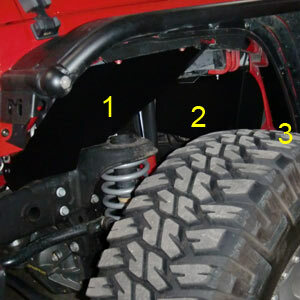 The JK Wrangler Replacement Aluminum Inner Fender Well is the only JK Aluminum Inner Fender Well in the industry. Protect your engine bay where necessary, eliminate coverage where its not, and bring engine temp down by as much as 30 degrees! 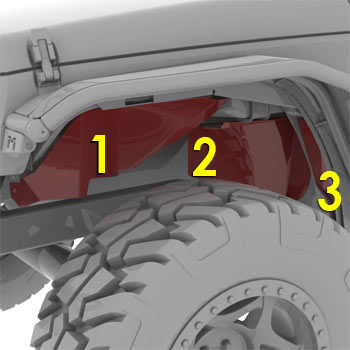 Designed to work specifically with MetalCloak JK and JK Unlimited Fenders (Overlines or Overlands) the inner fenders can be used without our fenders, but it will take additional drilling and modification to install. If you are not sure of the fitment, talk to a MetalCloak representative before purchasing. Note: This product is designed for MetalCloak fenders only. You may buy it and try to modify it for other types of fenders, but there is no guarantee that it will work. Here is a thread that details installation on a non-MC fender. Give Your JK Fenders that "Finished" Touch. Keeping with the tradition of Aluminum Fender wells, MetalCloak offers a three-part Replacement Aluminum Fender well system. Provides venting for engine area - temp lowers by as much as 30 degrees! NOTE: You can also reuse the stock plastic inner fender wells. These Aluminum Fender Wells are an option, not a necessity. This is a simple installation, you can dowload our instructions to see just how easy it is.